Click Here to purchase "THE"
SILVER direct from us (the Manufacturer). The silver particles are extremely fine, charged and suspended in distilled water with the aid of a special protein molecule. The solution comes shipped in a 4 oz. fl. U.S./118.291 ml.(c.c.) amber Boston round bottle.As a dietary supplement the normal dosage is 2.5 ml./c.c. (1/2 tsp. (teaspoon) per day/or per the advice of your Health Care Professional. Original 1938 broad spectrum Mild Silver Protein formula that was used to treat more than 650 different diseases, including viral infections, bacterial infections, cold and flu, nasal infections, eye and childhood ear infections, fungal infections, parasitic infections, etc. (Science Journal 1978). Because it is a pre 1938 formula, we can unequivocally state the cures for the same diseases that it was used to cure pre 1938. 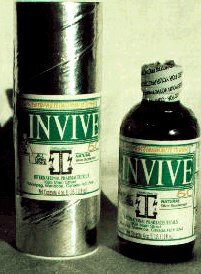 Invive 50 can be ordered by contacting International Pharmaceuticals. Introductory sale price is only $9.99 per bottle. On orders of 6 or more 8.99 per bottle). (Prices are in US dollars per 4 oz bottle, plus shipping.Delivery - Within 1 to 3 working days. Invive 500 is a high quality Mild Silver Protein that has been prepared with careful quality control by our laboratory. The concentration is 500 ppm. to a high degree of accuracy. The silver particles are extremely fine, charged and suspended in distilled water with the aid of a special protein molecule. The solution comes shipped in a 4 oz. fl. U.S./118.291 ml.(c.c.) amber Boston round bottle. Invive 500 can be ordered by contacting International Pharmaceuticals. "I have never observed any side effect from using MSP therapy, and I have used it in patients with all kinds of infections." Invive 30 is high quality Microscopic Silver Preparation in distilled water that has been prepared with careful quality control by our laboratory. The concentration is 30 ppm. to a high degree of accuracy. The silver particles are extremely fine, charged and suspended in distilled water with the aid of a special protein molecule. Price - ($49.99 ) regular price per bottle. Introductory sale price is only 39.99! on orders of 12 bottles or more. Prices are in Canadian dollars per 4 oz bottle, plus shipping. Delivery - Within 1 - 3 working days.